Webscan offers a large selection of barcode verifiers, otherwise known as barcode checkers. Regardless of your specific application, Webscan has the product that will fit your needs. Curious about which verifier is right for you? Check out our product descriptions below or have a Webscan representative contact you. The TruCheck Optima is one of Webscan’s most versatile barcode checkers. This hand-held verifier works with all of your 1D and 2D barcode symbols and repeatedly gives accurate results. The Optima provides a fully integrated and hand-held imaging head, reducing human error and maximizing effectiveness. Thanks to the Optima’s innovative design and integrated illumination, there is no focusing or aligning necessary. The TruCheck Omni offers an extra large field of view (up to 6 inches) and its 5-megapixel camera offers the highest resolution in the industry. Not only can you verify barcodes of different sizes, symbologies, and dimensions, but you can do it all in one scan with our software’s unique Multi-Mode setting. The TruCheck Omni’s minimal housing frees up space on your desk or production line. Solid-state LEDs run cool and last longer than the competitor’s expensive halogen lights. Still not sure if the Omni is right for you? Watch the TruCheck Omni product video to see these features and more in action! 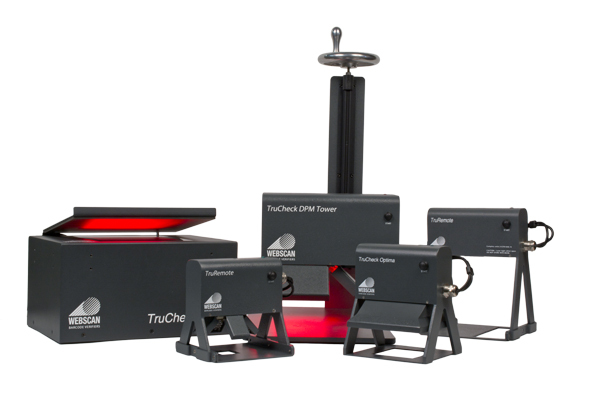 Gain a dynamic edge with the TruCheck DPM Tower. Are your barcodes directly marked on your product? Do they lie on difficult to verify surfaces? If so, then the TruCheck DPM Tower is the right product for you! The DPM Tower’s unique design allows you to adjust the working distance with an easy to handle adjustment wheel. We also offer a smaller version of the DPM Tower called the TruCheck FlexHite DPM. If your DPM symbols are not hard to reach, consider checking out our handheld DPM verifier. All of our verifiers in the DPM series give you the options of verifying any 1D and 2D barcode symbology as wide as 32mm and as small as 5 mil. The ‘DPM’ stands for ‘Direct Part Marked’, barcodes that are directly printed on the surface of a product. It comes equipped with the multiple lighting options needed to verify all direct part marks, whether they be Dot-peen or Laser Etched UID symbols. Versatile. Customized Illumination. Dynamic. Check out the DPM Tower in action! TNow you can verify all your 1D and 2D symbols with a portable handheld verifier from Webscan, the leader in high-performance barcode verification. Cut the cord — verify barcodes anywhere, anytime, while you are on-the-go. The TruCheck Rover™ from Webscan provides a fully integrated 2D CCD imager, integrated lighting, rechargeable battery and touchscreen for verification without any connection to a PC or other host computer. To verify 1D or 2D symbols, simply position the imager over a barcode and press the button. No swiping or manual scanning. Clear and concise results are displayed and stored automatically, and available for printing later.